Certain gastrointestinal disorders now are accepted as related to sensitivity to food components. Published reports have indicated additional disease in which dietary elements may play a role in pathogenesis. Diagnosis and treatment of food sensitivity related illnesses has been a cumbersome and imperfect process. Use of a combination of a new blood test, the Antigen Leukocyte Cellular Antibody test, and titration skin testing is suggested as a more efficient and an effective approach to these disorders. Three illustrative case reports are presented which provide insight into use of these techniques. 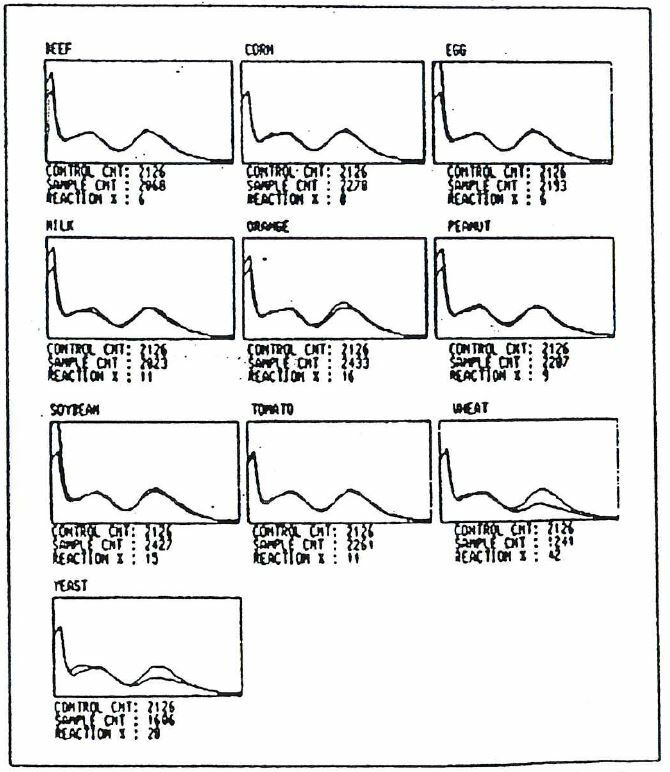 Int Pediatr 1990; 5:23-9. Few topics provoke more heated debate among physicians and health scientist than the possible role of foodstuffs in etiology of various medical disorders. In the field of gastroenterology, and particularly concerning the pediatric age group, it has become accepted that specific foods may contribute importantly to the pathogenesis of certain disease processes; namely milk-induced colitis of infancy, chronic enteropathy related to intolerance to cow’s milk or soy, etc. (table 1). However, a role in other entitities has been suggested in various reports published over many years (table 2). It is these reports which have generated most of the controversy. A somewhat unfortunate circumstance is that this scientific domain of diet-related illness has remained within the province of Clinical Allergy and thus is captive to many old biases; this has hindered progress in recognizing and treating the wider range of disorders related to food sensitivity and intolerance. Talmage, in his introductory chapter in the Annual Review of Immunology, 1986, discussed the basis for acceptance or rejection of a particular concept by the scientific community. He concluded that the decision for acceptance does not rest entirely on direct experimental evidence, but on the general milieu of related concepts that have preceded and followed it. (25) By his definitions of phases of acceptance, food sensitivity as a causative factor in a variety of disease is in the second phase: that of wide awareness of an interesting but controversial hypothesis. Progress in understanding the role that food stuffs can play in gastrointestinal disease could be greatly accelerated if gastroenterologists would remove it from the purview of allergists and devote some of their talents to investigating this fascinating subject. Although IgE-mediated processes play a role in some gastrointestinal complaints, there is increasing evidence that a majority of sensitivity reactions to foods involves other mechanisms. (26-29) It is likely that most of these are immunological. However, there are other mechanisms which may be involved in food-induced illness, (table 3). It should be remembered that a number of these mechanisms are quite uncommon and others on this list of speculative importance based on present knowledge and clinical correlation. Regardless, it is preferable still to refer to such reactions as due to sensitivity or intolerance, or as some allergists prefer, to adverse reactions, rather than as due to food allergy. When an immunological mechanism is demonstrated then it will be appropriate to identify reactions by the specific mechanism involved. Pathogenesis is recognized to be complex, with multiple genetic factors involve. There is a probable role for the intestinal mucosa as well as intraluminal components; for immunological responses involving antigen recognition and appropriate or inappropriate cellular and humoral responses; for mechanisms for selection of specific target organs, etc. Also, overall levels of reactivity may vary based on the body’s concurrent state of responsiveness to other external agents such as pollens, mold spores, animal emanations, chemicals, stress, etc. Effects of these intertwined processes are complicated further by influences of the patient’s mind, namely, perceptions of variable accuracy as to specific causes of symptoms, capability for or commitment to compliance with necessary regimens for diagnosis and management, etc. The consequence of attempts to understand such a complicated set of events is that the clinician managing individual patients often is better able to put the diverse factors in perspective than the investigator. The scientist has great problems designing a system that has control of the many variables; he studies one or two major factors but does not have a system which allows him to understand the larger picture. His larger picture is in fact comprised of adding up sequential studies of the different factors a few at a time. An important element affecting interpretation of results of clinical investigations in this area is the variable composition of the groups of patients being studied. The types of patients seen by different gastroenterologists in practice vary remarkably; this makes it difficult for them to compare studies from these different patient populations. These groups certainly do not reflect accurately the general pediatric population. However, the possibility that diet may play a significant role in some patients and the usually benign nature of investigation required make it worth while to attempt to answer this question in any chronic disorder which is otherwise not adequately treatable or in which the usual prescribed treatment carries with it some hazard or adverse effect. The Alcat Test is a new blood test developed as a screening test for adverse reactions to specific foods. This procedure utilizes electronic hematology instrumentation for cell counting and sizing combined with computerized data analysis to detect effects of pure food extracts with aliquots of whole blood. After lysis of red blood cells the sample is introduced into a modified electronic cell sizer and then the number cells remaining as well as size of the different cell determined. Data are fed to a computer which compares each reaction mixture with an unreacted “control” aliquot and prints a graph of each superimposed on the control graph. It also quantitatively determines the total cell number and size of cells in the area populated primarily by the granulocyte fraction. Reactivity is identified by decreases in cell number or shift in cell size, or both. Reproducibility and precision are quite good. Study of normal populations screened to eliminate individuals with allergic problems or known food intolerance showed little reactivity. (44) A recent double-blind study of the correlation of Alcat Test results with food challenge and response to elimination diets demonstrated good correlation (approximately 80%). (43) Further clinical studies being conducted presently should provide more information concerning the most useful ways to utilize this test. Intradermal titration with serially diluted doses of specific food extracts is not a new test. Lee first described this method in 1960. (45) Miller documented a systematic approach to use of this method for testing and for treatment of clinical problems related to food sensitivities. (46) He also carried out a well-designed double-blind study of treatment of a group of different clinical disorders using this technique which found superior results compared to placebo. (47) However, incorporation of this method into standard allergy practice has been extremely slow. Progress in unraveling the mysteries of food allergy and sensitivity will remain slow as long as these techniques are not adopted by other fields of medicine. Gastroenterology is one clinical area in which great strides could be made using these innovative methods. The rest of this article will be devoted to presentation of some selected patient with medical problems of varied nature in whom it was possible to identify a significant etiological role for foods and to use this information to formulate an effective, safe treatment. the individualized approach require for each patient illustrates use of history, in vitro testing for foods, skin testing, oral challenges and use of limited diets as well as food extract therapy. They are presented to suggest the usefulness of investigation of these and similar patients for the possibility that their clinical problems are related to sensitivity to one or more foods. Patient 1. A white male, was referred to this clinic at the age of 2-year-4-month old, with a history of episodes of “screaming with pain” since 3 weeks of age. During early infancy, he never slept for more than 1 to 2 hours before awakening crying and with apparent pain. Recent episodes were often accompanied by profuse diaphoresis, with “ice cold” hands and feet. The episodes appeared to become more seevere when breast feeding was discontinued. He had constipation during the first year of life; stools after that age had been normal and passed without discomfort. The episodes occurred from 2 to 7 days each week; at varying times of the day or night; lasted for several minutes an dat times recurred within 15 to 30 minutes. His mother was not able to associate the episodes with eating a specific food or foods. He was eating a fairly normal diet for his age except for very little milk or wheat-containing products and vegetables. He also had a history of recurrent upper respiratory tract infections with frequent associated otitis media with effusion. he had a history of bruxism and, in addition, his mother said that frequently he was irritable and moody. His past history was otherwise remarkable only for having had a moderate reaction to his first diphtheria – pertussis-tetanus injection. Subsequent injections of one-half the usual dose did not cause appreciable reactions. He had had urticaria and diarrhea when given oral amoxicillin 3 months previously. He had been breast fed for 18 months. His first formula was ProSobee. His mother had a history of irritable bowel syndrome. A brother had had mild eczema. During examination he had two episodes of apparent abdominal pain which his mother said were typical of those for which he was referred. He had finely lined palms and soles; examination was otherwise unremarkable. Figure 1. 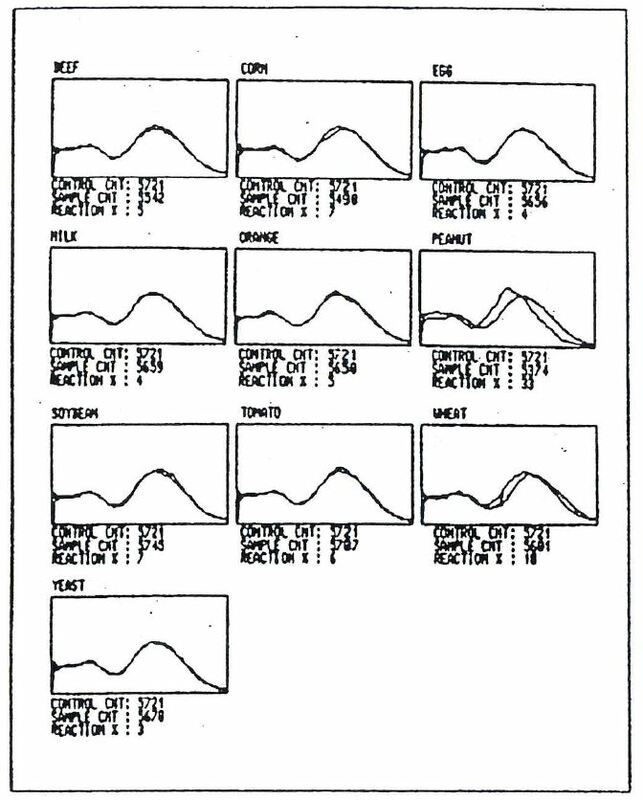 Alcat Test graphic results for patient 1. Mean cell size is reflected on the x axis while cell number is shown on the y axis. The two sets of graphs, (A) and (B), reflect different dates, one month apart. Results of complete blood count, routine urinalysis and upper gastrointestinal barium studies with small bowel follow-through were within normal limits. An Alcat Test blood screening for food sensitivities for 10 foods was done and showed greater than 105 reactivity to corn, milk, soy and yeast; beef, egg, orange, peanut, tomato and where were below 10% reactivity (10% is one standard deviation from the mean). The peak representing largely granulocytes was low even in the control sample, suggesting spontaneous reactivity in blood even without incubation with food extracts. Removal of the positive foods from his diet for 4 days resulted in reduction in number of episodes to one fourth of those experienced in the previous 4 days. Reintroduction of each of the 4 foods at different meals resulted in precipitation of acute episodes typical of his presenting complaint with milk, soy and yeast. Intradermal titration skin testing with those food extracts produced moderately positive wheals. Milk and yeast extract injections provoked very similar episodes to those seen previously, while soy extract administration was associated with a much milder but similar episode. Elimination of all milk and corn products from the diet was continued, while he was given subcutaneous injections of soy and yeast extracts daily. The treatment doses of extracts were determined by titration with serial dilutions of each extract to a point at which intradermal injection no longer produced a positive wheal (1:6250 dilution weight/volume). Corn was subsequently tested and produced a positive skin wheal at a dilution of 1:125 weight/volume but did not provoke any symptoms during testing. He improved markedly with episodes reduced to one every 1 1/2 to 2 weeks. However, he remained moody according to his mother. 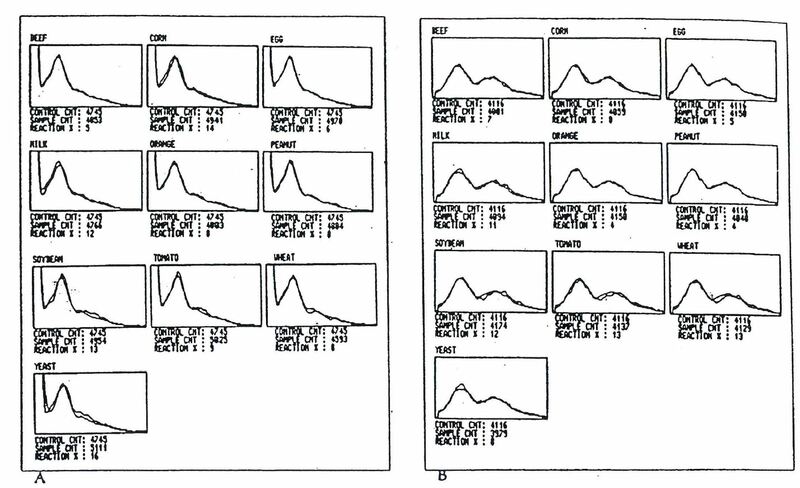 The Alcat Test was repeated approximately 1 month after the first test and showed an additional positive reaction to tomato (figure 1). Skin testing with that food extract produced a strongly positive wheal and provoked a typical episode of crying apparent pain. Wheat, orange, and a house dust mixture were tested and did not cause any symptoms during testing. He continued to do well with only rare, brief and mild episodes while on the milk product free diet and food extract injections given on alternate days. Linear growth was normal and he demonstrated catch up weight gain. The injections were discontinued after a 20 month period of therapy and he has continued to be well while maintaining a milk product free diet. Figure 2. Alcat Test graphic results for patient 2. Mean cell size is reflected on the x axis while cell number is shown on the y axis. Patient 2. A 13-year-11-month old white female was vomiting for approximately 2 months. These complaints began after an apparent episode of food poisoning following a meal at a small restaurant. She had abdominal pain, nausea and vomiting; a diagnosis was made of acute gastroenteritis. The following weekend she went to a camp in New England. There she continued to have decreased appetite and energy level, nausea, intermittent vomiting and abdominal pain. Routine complete blood count, urinalysis and plain abdominal radiographs did not show any abnormality. She had been taking ibuprofen for musculoskeletal pain around her knee and this was discontinued at that time. She also was treated with cephalexin without improvement and left camp 2 weeks early to return home. Further laboratory studies including urinalysis, chemistry profile, stool examination for bacterial pathogens and ova and parasites, and serum amylase were within normal limits. She continued to have epigastric pain and occasional vomiting, but did improve slowly. Her past history included asthma at age 3 years with some wheezing in the fall of each year. In the past citrus and milk products were said to have caused diarrhea. She also had a previous history of mild atopic dermatitis and perenial allergic rhinitis; she was said to be allergic to cats. She also had injured her left knee in the past and had chronic pain in that knee for which she had been taking ibuprofen. Physical examination was unremarkable. An Entero Test was done which was negative for giardia or other pathogens. Serum immunoglobulin G anti-H pylori antibodies were absent. An Alcat Test screening for food sensitivities was done and showed a definite positive reaction to both wheat and peanut. Beef, corn, egg, milk, orange, soy, tomato, and baker’s yeast showed no reaction (figure 2). A diet was prescribed eliminating wheat and peanut and the abdominal pain stopped abruptly. Five days later wheat was reintroduced at one meal and was followed by abdominal pain within an hour. Elimination of wheat from the diet was reinstituted and there was no recurrence of pain or other gastrointestinal symptoms. Figure 3. Alcat Test graphic results for patient 3. Mean cell size is reflected on the x axis while cell number is shown on the y axis. Patient 3. A 4 1/2 year old white female was referred with a history of chronic gaseous abdominal distention since the age of 2 1/2 years. The distention had been more marked in the 2 months prior to her first visit to our clinic and this change was associated with concurrent abdominal pain. Early in the history of this complaint, the distention was intermittent, occurring approximately once monthly. In the 2 months prior to her first visit, it had been present almost daily, and was associated with some periumbilical pain and malodorous stools; these were passed 3 to 4 times daily. She also was said to have lost as much as 10 pounds weight in the past several months. her diet was not unusual for her age, although her parents said that she disliked beef, chicken and milk as well as most vegetables. An extensive array of tests and radiographs had been performed, including complete blood count, erythrocyte sedimentation rate liver function tests, chemistry profile, serum protein electrophoresis, serum immunoglobulins and alpha-1-antitrypsin, blood folic acid and vitamin B12 concentrations, vitamins D and E, sweat chloride concentration, lactose breath test, lipoprotein electrophoresis, examination of stools for pathogenic bacteria, occult blood, reducing substances and ova and parasite; routine urinalysis, xylose absorption test, abdominal sonography and computed tomography, upper gastrointestinal barium contrasts studies with small bowel follow-through, and upper gastrointestinal panendoscopy, all of which were within normal limits. A diagnosis had been made of air swallowing as a cause for the chronic abdominal distention. At the time of physical examination her abdomen was moderately diffusely distended with air, and active bowel sounds were present throughout the abdomen. There were no other abnormalities on examination. A xylose breath test for bacterial contamination was within normal limits. An Alcat Test screening for food sensitivities was done for 10 commonly eaten foods. It showed markedly positive reactions to wheat and eyast with lower reactivity to soy and milk. Beef, corn, egg, orange, peanut and tomato were unreactive (figure 3). Intradermal titration skin tests were performed for milk, wheat, corn, baker’s yeast and rice; positive reactions were found to milk, wheat, and yeast. A diet eliminating foods containing wheat and yeast resulted in disappearance of the abdominal distention within 2 days. After a period of weeks she then resumed eating small amounts of bread and other foods containing wheat and the distention recurred within approximately one month. The wheat and yeast were removed from her diet and the distention again disappeared. Gradual reintroduction of the wheat and yeast by her mother was followed within 3 to 4 weeks by recurrence of abdominal distention, this time with associated diarrhea. She was skin tested again with wheat and yeast extract and after titration of the dose with progressively weaker dilutions she was given a mixture of 2 diluted extracts to take twice daily as sublingual drops. She was allowed to eat moderate amounts of wheat and yeast containing foods and with this regimen there has been no recurrence of abdominal distention over a two year period. Although individual case report do not prove a hypothesis they may suggest useful directions for further investigation. Both the Alcat Test screening for food sensitivity and food extract therapy warrant further investigation and wider application to gastroenterological problems possibly related to food sensitivity. This can be best accomplished in the present intellectual climate of bias in clinical allergy, if these tools are adopted and utilized by gastroenterologists working in the pediatric age group. Both of these procedures have much to offer for advancement of our understanding of these problems. Use of food extract therapy allows one to examine response of specific problems to treatment without concurrent changes in diet. The Alcat Test allows examination of reaction mechanisms related to foods in an in vitro system. 10. Vitoria JC, Camarero C, Sojo A, Ruiz A, Rodriguez-Soriano J. Enteropathy related to fish, rice and chicken. Arch Dis Child. 1982; 57:44-8. 14. Walker-Smith JA. Cow’s milk intolerance as a cause of postenteritis diarrhea. J Pediatr Gastroenterol Nutr. 1982; 1:163-73. 15. Gryboski JD, Katz J, Reynolds D, Herskovic T. Gluten intolerance following cow’s milk sensitivity: two cases with coproantibodies to milk and wheat proteins. Ann Allergy. 1968; 26:33-9. 16. Alun Jones V, McLaughlan P, Shorthouse M, Workman E, Hunter JO. Food intolerance: a major factor in the pathogenesis of irrtiable bowel syndrome. Lancet. 1982; 2: 1115-7. 17. Alun Jones V, Dickinson RJ, Workman E, Wilson AJ, Freeman AH, Hunter JO: Crohn’s disease: maintenance of remission by diet. Lancet. 1985; 2:177-80. 19. Ratner B. Abdominal pain in children due to allergy. JAMA. 1945; 127:696. 20. Buisseret PD. Common manifestations of cow’s milk allergy in children. Lancet. 1978; 1:304-5. 21. Alun Jones V.Irritable bowel syndrome. In: Hunter JO, Alun Jones V, eds. Food and the Gut. London: Bailliere Tindall; 1985:212. 22. Egger J, Carter CM, Wilson J, Turner MW, Soothill JF. Is migraine food allergy? Lancet. 1983; 2:865-8. 23. Scudamore HH, Phillips SF, Swedlund HA, Gleich GJ. 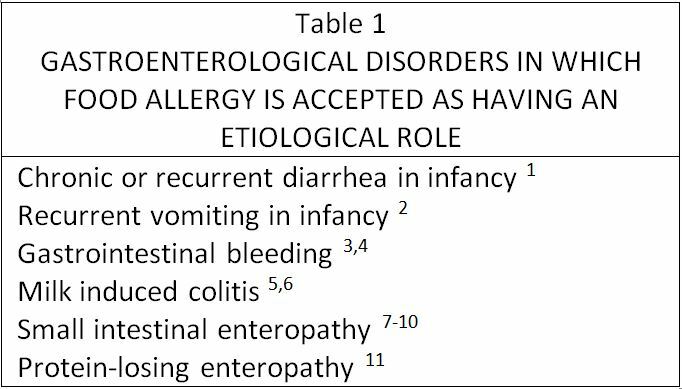 Food allergy manifested by eosinophilia, raised IgE levels and protein losing enteropathy: the syndrome of allergic gastroenteropathy. J Allergy Clin Immunol. 1982; 70: 129-38. 24. Greenberger N, Gryboski JD. Allergic disorders of the intestine and eosinophilic gastroenteritis. In: Sleisenger MH, Fordtran JS, eds. Gastrointestinal disease. 2nd ed. Philadelphia: Saunders; 1979: 1066-82. 25. Talmage DW. The acceptance and rejection of immunological concepts. Ann Rev Immunol. 1986; 4:1-11. 26. Matthews TS, Soothill JE. Complement activation after milk feeding in children with cow’s milk allergy. Lancet. 1970; 2:893-5. 27. Frick OL. Beta-lactoblobulin in immune complexes in milk-sensitive children. J Allergy Clin Immunol. 1982; 69 (suppl): 157. 29. Minor JD, Tolber SG, Rick OL. Leukocyte inhibition factor in delayed-onset food allergy. J Allergy Clin Immunol. 1980; 66: 314-21. 30. Moneret-Vautrin DA. False food allergies: nonspecific reactions to foodstuffs. In: Lessof MH, ed. Clinical of food. Chichester: Wiley; 1983: 135-53. 31. Gardner MG. Production of pharmacologically active peptides from foods in the gut. In: Hunter JO, Alun Jones V. eds. Food and the gut. London: Bailliere Tindall; 1985: 121-34. 32. Noah ND, Bender AE, Reaidi GB, Gilbert RJ. Food poisoning from raw red kidney beans. Br Med J. 1980; 2:236-7. 33. Brand V, Teschemacher H. A material with opioid activity in bovine milk and milk products. Naunyn-Schmiedeberger’s. Arch Pharmacol. 1979; 306: 301-4. 34. Zioudrou C, Streaty RA, Klee WA. Opioid peptides derived from food proteins: the exorphins. J Biol Chem. 1979; 254:24446-9. 35. Boublik JH, Quinn WJ, Clements JA, Herington AC, Wynne KN, Funder JW. Coffee contains potent opiate receptor binding activity. Nature. 1983; 301: 246-8. 36. Sampson HA. 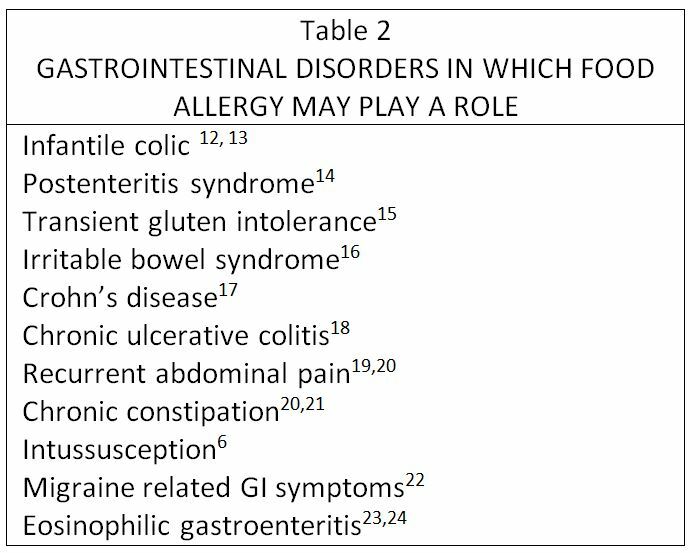 Immunologically mediated food allergy: the importance of food challenge procedures. Ann Allergy. 1988; 60:262-9. 37. May CD, Bock SA. A moderl clinical approach to food hypersensitivity. Allergy. 1978; 33: 166-88. 38. Powell GK. Milk-and soy-induced enterocolitis of infancy. Clinical features and standardization of challenge. J Pediatr. 1978; 93: 553-60. 39. Freed DJ. 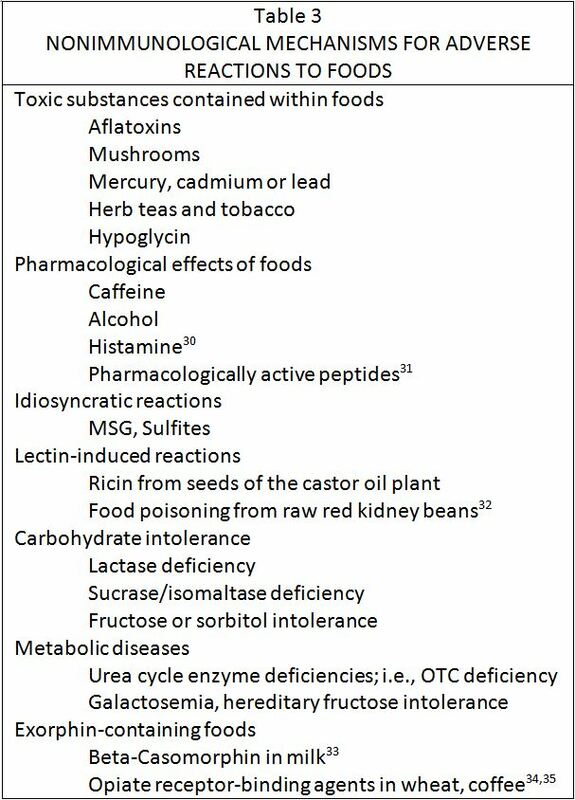 Laboratory diagnosis of food intolerance. In: Brostoff J, Challacombe SJ, eds. Food allergy and intolerance. London: Bailliere Tindall; 1987: 873-97. 40. Kuitunen P, Rapola J, Savilahti E, Visakorpi JK. Light and electron microscopic changes in the small intestinal mucosa in patients with cow’s milk induced malabsorption syndrome. Acta Paediatr Scand. 1972; 6: 237. 41. Andre C, Andre F, Colin L, Cavagna S. Measurement of intestinal permeability to mannitol and lactulose as a means of diagnosing food allergy and evaluating therapeutic effectiveness of disodium cromoglycate. Ann Allergy. 1987; 59(2): 127-30. 42. Morin CL, Buts JP, Weber A, Roy CC, Brochu P. One-hour blood-xylose test in diagnosis of cow’s milk protein intolerance. Lancet. 1979; 1:1102-4. 43. Fell PJ, Brostoff J, Pasula MJ. High correlation of the Alcat Test results with double blind challenge (DBC) in food sensitivity. Presented at the American College of Allergy and Immunology 45th Annual Congress. Los Angeles, November 15, 1988. 44. Sandberg DH, Pasula-MJ-A comparison of the Alcat Test for food reactions amongst two population sub-groups. Presented at the American college of Allergy and Immunology 45th Annual Congress. Los Angeles, November 13, 1988. 45. Lee CH. Titration method of food testing and treatment. Bull Buchanan County Med Soc. 1961; 15:9-12. 46. Miller JB. Food allergy: provocative testing and injection therapy. Springfield; Thomas: 1972. 47. Miller JB. A double-blind study of food extract injection therapy. Ann Allergy. 1977; 38:185-91.